The combustibles portfolio, although in structural decline, generates significant free cash flow which funds a growing, substantial dividend. Simply valued on these free cash flows, British American Tobacco is an attractive investment. The NGP (Next Generation Products) portfolio, which is less than 5% of Group revenues, is a potential future call option on a return to volume growth. Buy for a potential short term rebound, or as a long term dividend compounder. British American Tobacco’s torrid 2018 (Down 49% on the LSE) may have created a once in a lifetime opportunity for entry into this high quality company. Despite a modest 21% bounce in the shares this year, the shares are well off 2017 highs (Current share price is 56% of the all-time high), and still very attractive on valuation metrics, with a number of potential earnings catalysts on the horizon. What multiple would you be prepared to pay for the above free cash flow profile? It is a profile of consistency and reliability, where shareholders receive the benefits through a high dividend payout ratio. The free cash flow yield at 11% more than covers the dividend yield of 6.5%, reinforcing the sustainability of the dividend and allowing for the paying down of the Group’s debt. Clearly the reason for the share’s selloff last year was the Reynolds acquisition, which unfortunately coincided with a barrage of US regulation on tobacco (The most dangerous one being the ban on menthol cigarettes). Net debt to EBITDA ballooned from 3.4X in 2016 to 6.5X immediately post the acquisition. This has since moderated to 4.5X, and should continue to drop, which should greatly assist in alleviating investor concerns of the sustainability of the balance sheet. The ban will very likely only be implemented at the earliest in 2023 (Caveat here is that industry does need an injunction to be granted against the FDA towards the end of this year. These are almost always granted), given the process the FDA is required to follow. The recent resignation of the FDA Chief Scott Gottlieb reduces the probability that the ban will ever see the light of day. British American Tobacco has five years to migrate customers to alternative products and reduce exposure to menthol. 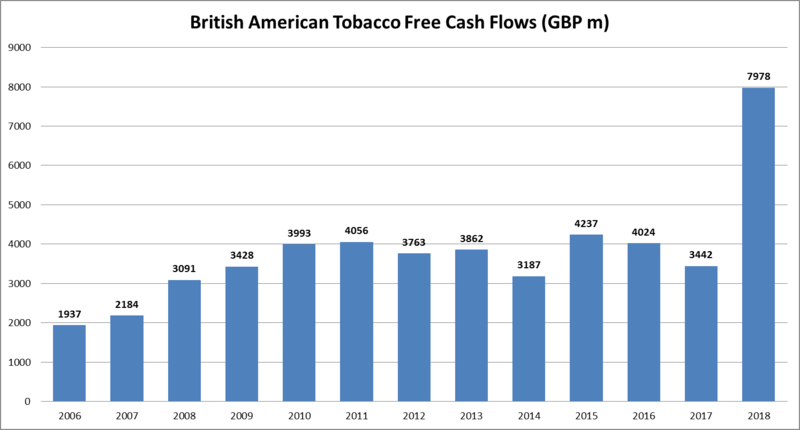 Given the long implementation timeline, British American Tobacco will only feel the free cash flow impact once implemented, and therefore will be able to continue to pay down debt over the next five years, bringing gearing ratios into targeted ranges well in advance of an actual ban. I would also caution against worrying too much about regulation, this is an industry that has had to function in harsh regulatory conditions for many decades, and throughout has continued to deliver substantially better than market total shareholder returns. Lawsuits and restrictions on product sales will always be a part of the business. Currency tailwinds to earnings versus the currency headwind experienced in 2018. Quicker degearing than the market anticipates (The company is a substantial free cash flow generator as shown above), leading to a lower interest cost bill, further enhancing earnings. Rerating in the shares, particularly if bond yields remain low, given the strong negative correlation between British American Tobacco’s rating and bond yields. Any backpedaling / delays in proposed FDA regulations (I think it’s fair to say we shouldn’t see any more significant regulatory proposals on tobacco as the FDA will have their hands full for the foreseeable future with what has already been proposed – Menthol ban / vaping restrictions / nicotine reduction in combustibles). A simple DDM valuation shows that the current share price is implying a terminal growth rate of ~3.5% (Using a required return of 10%). Compared with a historical 10 year CAGR in earnings of 8.7%, as well as what I believe to be an easily achievable 5 – 9% targeted earnings growth rate p.a. going forward, and the optionality of growth in NGPs, I think British American Tobacco is still very attractively priced. My conservative fair value for the share is ~GBP41, implying 30% upside to the current share price, however the share could be worth substantially more should any of the above catalysts materialise. 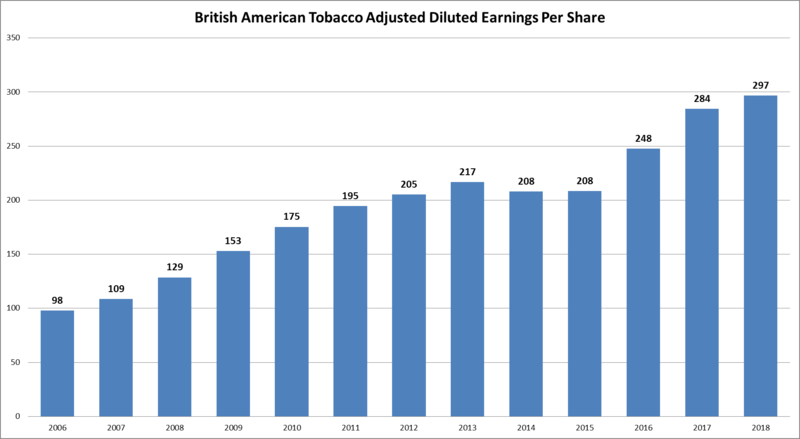 Given the defensive characteristics of the shares and a market at somewhat frothy valuations, British American Tobacco certainly justifies its existence in an investor’s portfolio. Disclosure: I am/we are long BTI. I wrote this article myself, and it expresses my own opinions. I am not receiving compensation for it (other than from Seeking Alpha). I have no business relationship with any company whose stock is mentioned in this article.